Oct. 26, 2017 — New mothers now have another convenient resource available at our Archer Road hospital/health science center complex: A new modular “lactation pod” for moms on the go provides a private space for pumping or breastfeeding. “With our large population of faculty, staff, residents and students, as well as patients and visitors, we needed another discreet and welcoming lactation space at the academic health center,” said Dennis Hines, UF Health Medical and Health Administration associate director. 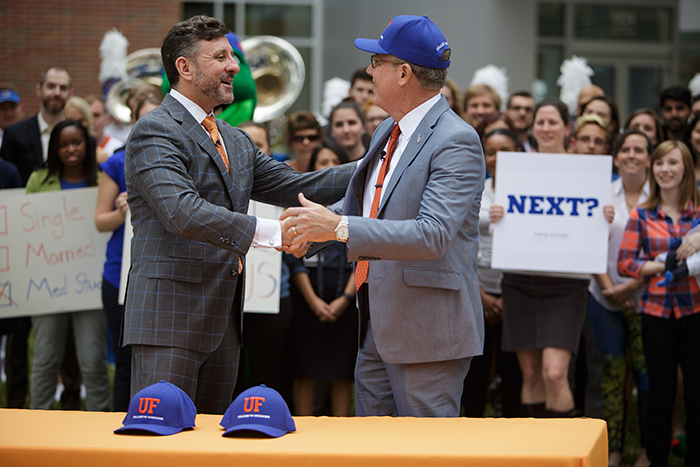 UF Business Affairs purchased the $15,000 mobile unit. It was installed in September in a centrally accessible space near the first-floor outpatient pharmacy, between the UF Health Shands Hospital Atrium and UF College of Dentistry/west entrance. Mamava, the manufacturer, designed the pods to “reach mamas where they travel, receive health care, work, shop and play.” They are often located in medical facilities, airports and malls, for example. Compact yet comfortable, they offer a locking door that indicates if the unit is vacant or occupied. Each well-lit pod has two molded plastic benches, a shelf, an electrical outlet and a USB port. They can easily be moved when needed. A new lactation pod offers a first-floor option for nursing mothers, located between the UF Health Shands Hospital Atrium and UF College of Dentistry/Health Science Center west entrance.